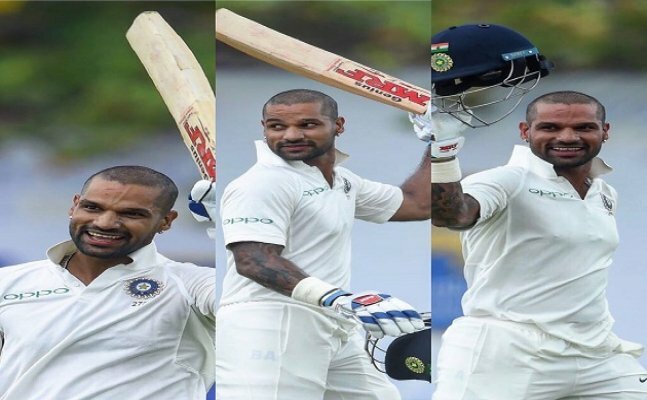 On the very first day of the series, Sri Lankan team got to know why India is the number one test side as Shikhar Dhawan and Cheteshwar Pujara completely frustrated their bowling attack. Indian batsman ended up scoring almost 400 runs on a single day which is rarely seen in test match cricket. On the very first day of the series, Sri Lankan team got to know why India is the number one test side as Shikhar Dhawan and Cheteshwar Pujara completely frustrated their bowling attack. Indian batsman ended up scoring almost 400 runs on a single day which is rarely seen in test match cricket. Cheteshwar Pujara and Ajinkya Rahane remained unbeaten on 144* and 39* respectively at the close of play. Shikhar Dhawan went on to score his highest ever test score, although he fell short of a double century by just ten runs. Cheteshwar Pujara scored his 12th test hundred and and unlike Dhawan, he still stands a chance to get a double hundred. Quite surprisingly, Captain Virat Kohli had not been amongst runs and fell cheaply and Abhinav Mukund , who luckily got his chance in this match, failed to grab the opportunity. Nuwan Pradeep had been the only bowler who looked a threat as he picked up all three wickets that fell on day 1. This had also been a memorable day for Hardik Pandya as he makes his debut as the 289 th cricket to play for India in Test matches.